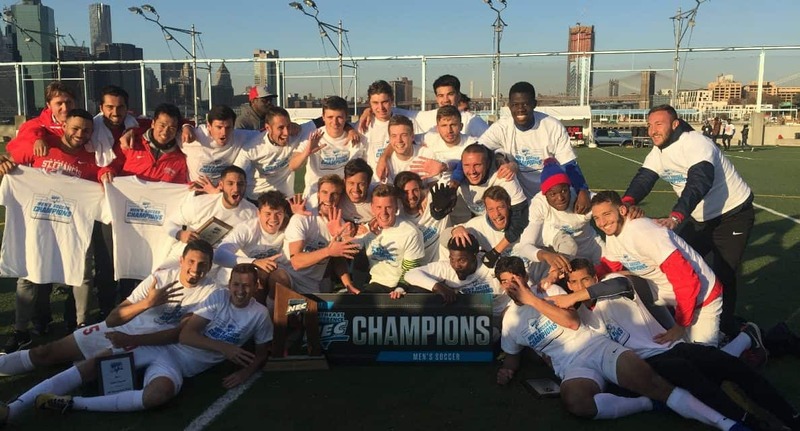 BROOKLYN, N.Y. – It was an all-Brooklyn battle on Sunday afternoon at Pier 5 of Brooklyn Bridge Park with the Northeast Conference men’s soccer title at stake. The two neighborhood rivals typically play right down to the wire, but this day belonged to St. Francis Brooklyn as the Terriers took control from the start en route to a 5-0 victory over LIU Brooklyn. It marked the second consecutive title for the Red & Blue and fourth in the last five years. The five-goal differential tied for the biggest in NEC Championship match history. Fairleigh Dickinson beat Mount St. Mary’s, 7-2, to win the 2008 crown. St. Francis (14-4-1) picked up right where it left off in Friday’s semifinals when NEC Tournament MVP Ali Tounkara, a junior striker, scored his third goal of the tournament when he was able to get past the LIU defense in the 10th minute. Dominick Falanga added another goal in the 24th minute, his seventh of the year, converting a header off of a long service into the box from Marco Torriani. In the 60th minute, it was Tounkara again slipping past the LIU backline and scoring his NEC record-tying fourth goal of the tournament to give the Terriers a three-goal advantage. It was his league-leading eighth tally of the season. Junior midfielder Sami Gliguem added a fourth goal, putting home a rebound in the 75th minute. St. Francis outshot LIU (6-9-3), 18-4. Goalkeeper Robert Bazzichetto earned his seventh shutout of the season. Anthony Sciola made three saves for the Blackbirds. The NCAA Division I men’s soccer announcement will air on NCAA.com Monday at 1 p.m. ET.